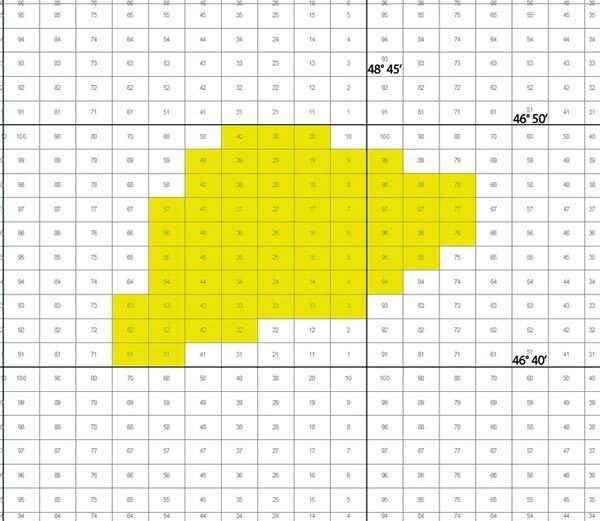 In the oil and gas industry, companies must routinely generate maps showing current exploration and drilling leases. But generating tenure maps is not straightforward; the geographic coordinates necessary for correct plotting of land lease boundaries are typically not stored in proprietary databases. Instead, the databases store text-based descriptions of lease areas. These descriptions consist of lists of “cells” of the region-specific grid system used to define oil and gas leases. To build a map feature that identifies the entire land or ocean floor area covered by a given lease, the location of each cell must be obtained from another source, and the cells merged together to create a single polygon. Since this intensive data processing can significantly impact workflow productivity, many companies are seeking efficient processes that are able to generate these features automatically. Chevron Canada Resources’ Application and Information Management Team, based in Calgary, Alberta, relies on a simple but powerful FME data transformation workflow to quickly extract data from disparate databases to generate the required lease polygons. The entire process is managed by a data transformation workflow within FME Workbench that typically requires only ten FME transformers, six of which perform the key tasks. As a first step, the SQLExecutor transformer extracts the text-based lease descriptions from Chevron’s Oracle® database. Data output from the SQLExecutor then passes to the ArcSDEQuerier transformer, which retrieves latitude and longitude coordinate values for each specified cell from an ESRI® ArcSDETM database. The CoordinateSystemSetter then converts the entire grid to NAD27, and passes the data to the AreaOnAreaOverlayer, Dissolver and Aggregator. These transformers merge the cells together to build the final polygon that defines the entire area of the lease. The final result is written back into SDE as a lease layer, ready for direct import into various mapping applications.